A complete, step-by-step guide to setting up and running a successful reading workshop in grades 5-12. Part I, "Management of the Reading Workshop," offers a host of specific strategies, techniques and reproducible materials for classroom management and student evaluation. Part II, "Using Mini-lessons in the Reading Workshop," provides 100 different ready-to-use mini-lessons focusing on specific reading topic and skills. Gary Robert Muschla, B.A. and M.A.T., Trenton State College, has over 22 years' experience as a classroom teacher. He is a member of the Authors Guild and the National Writers Association, and currently teaches at Appelby School in Spotswood, New Jersey. 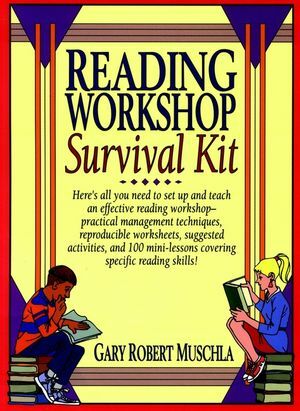 He is the author of many practical resources for teachers, among them The Writing Teacher's Book of Lists (Prentice Hall, 1991), the Writing Workshop Survival Kit (C.A.R.E., 1993) and English Teacher's Great Books Activities Kit (C.A.R.E., 1994). PART I: Management of the Reading Workshop. Chapter 1: An overview of the reading workshop. Reading in the reading workshop. Reproducible: "Elements of the Reading Workshop". Teacher and student roles in the reading workshop. Reproducibles: "The role of the teacher in the reading workshop". The value and use of mini-lessons. Chapter 2: Managing the reading workshop. Reproducible: "Student responsibilities in the reading workshop". Reproducible: "Promoting a positive atmosphere in your reading workshop". Teaching methods in the reading workshop. Reproducible: "Possible questions for reading logs". Strategies to organize discussion groups. Incorporating discussion groups in your reading workshop. Daily logs of student performance. Reports, projects, and special activities. Grades in the reading workshop. Reproducible: "Self-evaluation question for teachers". Mini-lesson 1 through 50 Types of reading and related topics. Short stories, novellas, and novels. The poetry of Native Americans. Japanese Poetry-- Free verse, Tanks, and Haiku. Anthologies, sequels, trilogies, and series. Pseudonyms-- Why authors use them. Helping students select books for reading. Mini-lessons 51 through 76 Story Elements. Beginnings: prefaces, forewords, prologues, and introductions. Endings: Epilogues, afterwords, and conclusions. What makes a good lead?. Mini-lessons 77 through 100 Specific Reading Skills. Strategies for improving reading comprehension. The importance of using context cues. Making inferences and drawing conclusions. Reference sources in the library.